Each year a growing number of students are opting for dual-credit courses. With signs of spring in the air, many Washington high school students are once again registering for next year’s classes. A growing number of those students are opting for dual-credit courses – classes that give them the opportunity to earn high school and college credit at the same time. In fact, nearly 60 percent of the state’s high school students took advantage of such classes during the 2017-18 school year. Washington students can earn dual credit by passing a college course (through Running Start or College in the High School); passing an exam at a certain level (through Advanced Placement, International Baccalaureate and Cambridge International); or completing a career and technical education dual-credit course (such as a Core Plus Aerospace manufacturing class like the ones offered at Franklin Pierce High School in Tacoma or Sno-Isle TECH in Everett), all while still in high school. Many families are aware of Running Start, which offers 11th and 12th grade students the opportunity to take college courses, taught by college faculty on college campuses. 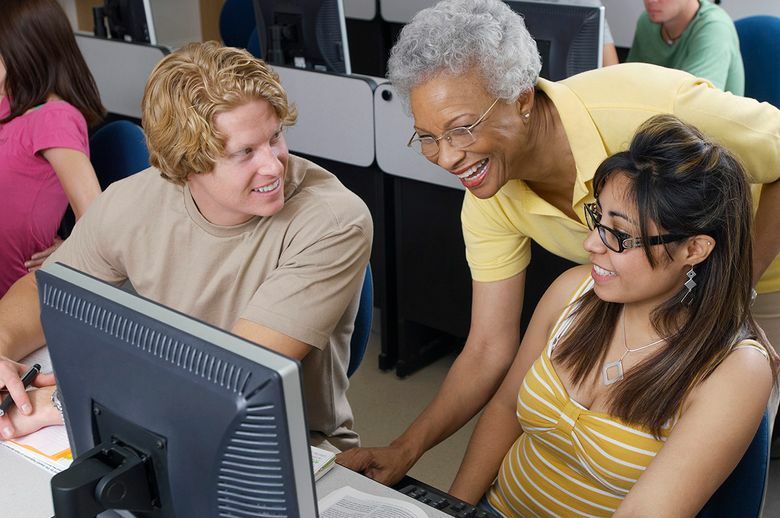 College in the High School is similar, but students take college-level courses with a specific college or university in their own high school. “Teachers are approved, trained, and supported by university faculty,” says Tim Stetter, director of UW in the High School – the University of Washington’s version of College in the High School. “Students who register for UW credit establish a UW transcript, and their UW courses, grades, and credits are recorded on that transcript.” Stetter says UW credits transfer widely around the state and country. Some students enroll in dual-credit courses to get a head start on a career. CTE Dual Credit, formerly known as Tech Prep, helps students transition from high school to postsecondary professional and technical programs through partnerships with community and technical colleges and local businesses. Like College in the High School, these courses are offered on the high school campus and are taught by high school teachers. According to the Washington Student Achievement Council, more than 70 percent of job openings in 2020–2025 will require a postsecondary credential, such as an associate or bachelor’s degree, industry certification or apprenticeship program. Dual credit provides a fast track to credential attainment, helping today’s students earn the credentials they need for tomorrow’s jobs. Dual enrollment can help close the equity gap. At Rogers High School in Spokane, graduation rates jumped from about 50 percent in 2007-08 to 87.5 percent in 2018, which exceeds the state average of 79.3 percent. Principal Laurie Wyborne says Rogers has made it a priority to eliminate barriers to dual credit. She estimates that between 150-200 juniors and seniors (of 575-600) are enrolled in College in the High School, and 62 percent of juniors take AP English. Reykdal says, “It’s about equity and giving every student that opportunity to try a dual-credit option that fits their interests and goals. It’s important for underrepresented and first-generation students to see that they can do these types of courses and get a head start in meeting their post-high school goals.” No-cost and low-cost options are available. Partnership for Learning, the education foundation of the Washington Roundtable, brings together business leaders and education partners to improve our state’s education system, so Washington students are ready to pursue the career pathways of their choice. Learn more at credentialessential.com.